Dreams turned into reality for Pampanga-based Marilyn Lagarde when she became the lucky recipient of a brand-new Lexus NX 200t and Php100, 000 worth of Caltex StarCash from Robinsons Rewards and Chevron Philippines Inc.’s (CPI) Christmas promo. The grand prize winner recently received the Lexus NX 200t keys and Caltex StarCash from CPI country chairman Peter Morris and Robinsons Retail Holdings Inc. President and COO Robina Gokongwei-Pe during the awarding ceremony at the Lexus Showroom in Bonifacio Global City. 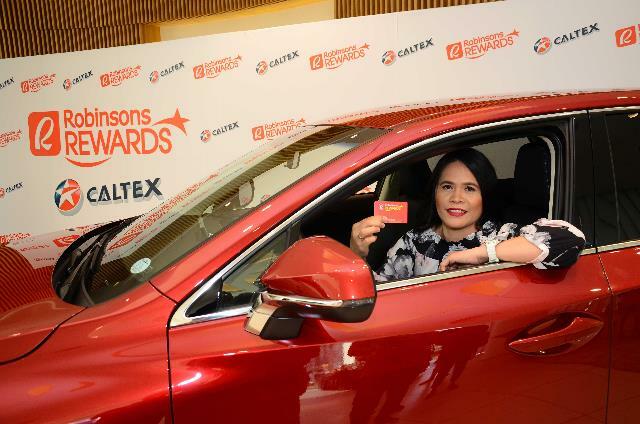 Robinsons Rewards and CPI’s Christmas promo gave over a million Robinsons Rewards Card members a chance to win the compact luxury crossover, Caltex StarCash for free fuel and Robinsons gift certificates. RRC members simply had to present their Robinsons Rewards Card at participating Caltex stations to get an electronic raffle entry for every Php1,000 worth of fuel purchase from November 15, 2016 to January 15, 2017. Aside from the grand prize, the promo also gave away Php10, 000 worth of StarCash to 10 lucky RRC members and Php10, 000 worth of Robinsons gift certificates to another set of 10 lucky RRC members. “The perks, discounts and rewards points I get for shopping and fueling up at Caltex make the Robinsons Rewards Card an indispensable part of my lifestyle. Promo partnerships between Robinsons and trusted brands like Caltex encourage loyalty among customers like me and allow us to maximize the value of our money. Now, I even won a brand-new luxury car because of their Christmas promo. I’m excited to see the upcoming surprises Caltex and Robinsons Rewards have in store for Filipino consumers,” said Lagarde. RRC members can earn points each time they shop at any Robinsons store or gas up at Caltex stations. These points can then be used to pay for future purchases at Robinsons stores and Caltex stations. RRC members get to experience the five key benefits of Caltex with Techron in every Caltex gas-up: maximized power, better fuel economy, smoother drive, lower emissions, and reliable performance. “Our recent partnership with Robinsons Rewards allowed us to bring more value-added experiences to our shared customers. We’re working on more exciting promos and surprises with the Robinsons team, so more customers will get to experience not only the best of our loyalty rewards, but also the key benefits of Caltex with Techron,” said Peter Morris. “Working with Chevron, a partner that shares the same vision of bringing more value to our loyal customers, has clearly made Robinsons Rewards the best rewards program in the metro. Our long-term partnership with Chevron will definitely bring forward more exciting deals, discounts and prizes for Robinsons Rewards cardholders,” said Robina Gokongwei-Pe.